Mostly, in my practice, mental illness is a sort of co-morbid condition to the reason I'm following. Some recent experiences have me thinking about the chronic, debilitating (and even, in a few cases, potentially fatal) nature of mental illness. The Awakenings Project is an initiative started with the mission to assist artists with mental illness with their art and to help them use art as a creative outlet. The project deals not only with art, but also with music, literature, and drama. Here I'm focusing more on the art. The painting to the left is entitled "On the Threshold of a Dream" by Awakenings Project artist Kurt Taecker. Taecker had been living with mental illness since age 17 and died January 2010. 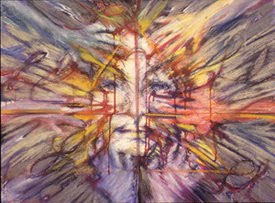 His art "reflected the twists and turns in his mind". He once said the process of creating his art gave him "is a sense of healing, a momentary lessening of anguish." 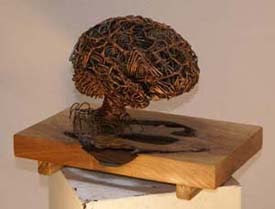 The sculpture to the right, entitled "Peter's Brain" by Peter Austin is a tangled mess of roots. 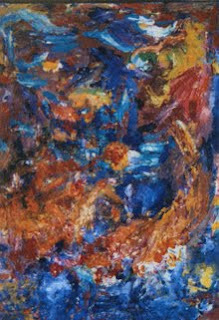 To the left is "Peter 12X24". Both images are self portraits. How the artist sees himself, his brain. His brain is almost spider-like, twisted. 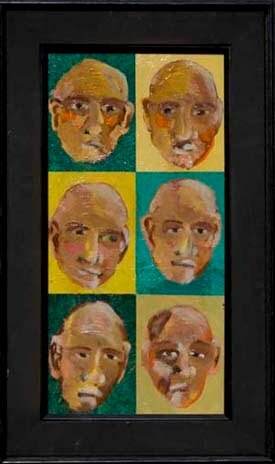 The faces are misshapen, each different from the rest. The last painting is entitled "Smoothing the Shroud" by Trish Evers. She was a co-founder of the Awakenings Project and died from uterine sarcoma in 2000. Hands smooth out the somewhat blurred image of a face. All the different colored hands seem to be lending support and everything in the painting radiates from the face. What jumps out at me the most are the eyes. While almost every other feature is touched by the hands or the other rays of color coming from the face, the eyes seemed untouched. When you hit the Awakening link, there's a warning that their site has been reported as "an attack site" (that distributes "harmful software"). Could be a mistake, but might look into it. Thanks for the tip on the link -I've taken it down for now until I can sort out a "safe" link. I removed the link and put up a warning and double checked Palliemd Arts which is clear of malware. As the "webmaster" of Awakenings, I am not that knowledgeable but I worked with our hosting company to remove any "malware." It has been cleaned up for several months now. I am afraid that your announcement and comments might scare people away from our website www.awakeningsproject.org. Can you help? THANKS. The links have been restored. Thanks for following up with us.